The Gannon University men´s and women´s swim teams returned to action this semester with a pair of meets, one against John Carroll University and the other against Edinboro University. The women´s team moved to 2-6 by splitting its two meets. The Knights followed up a 132-98 loss to John Carroll on Jan. 12 by beating Edinboro, 130-125, in their final home meet of the season Friday. On the men’s side, the Knights improved their record to 5-3 with a pair of victories. The Knights beat John Carroll, 124-113, and Edinboro, 176-171. Both teams’ meets against Grove City College on Saturday were canceled due to weather issues. Both teams will return to action Saturday against Canisius College in Buffalo. The women´s team won eight events Friday night against Edinboro while the men´s team won 12 events. Silvija Taraska, Leilani Kunf and Celia Kottakis were three-event winners for Gannon. Taraska won the 50-yard freestyle for the second consecutive time, this time in 23.98 seconds. In addition, she remains undefeated in the 200 freestyle (1:55.75). Kottakis claimed her first wins of the season in the 100 freestyle and 200 butterfly (55.15 and 2:21.89, respectively). Kunf collected her second win in the 100 and 200 backstroke events (1:00.44 and 2:15.64, respectively). Allyson Ahl won the 500 freestyle for the first time (5:31.35), and Cassidy Burns recorded her third victory this season in the 100 butterfly (1:00.79). In the men´s meet against Edinboro, Brent Benedict won four events, while Jon Ekas and David Gallion were three-event winners. Benedict earned his third win in both the 100 freestyle and the 100 butterfly (46.51 and 50.27, respectively), remaining undefeated in all individual events this seasons. His winning time in the 100 butterfly was also a facility record. Gallion remained undefeated in the 200 butterfly and set a pool record (1:42:15), and he also won the 200 IM (2:00.42) for the first time. 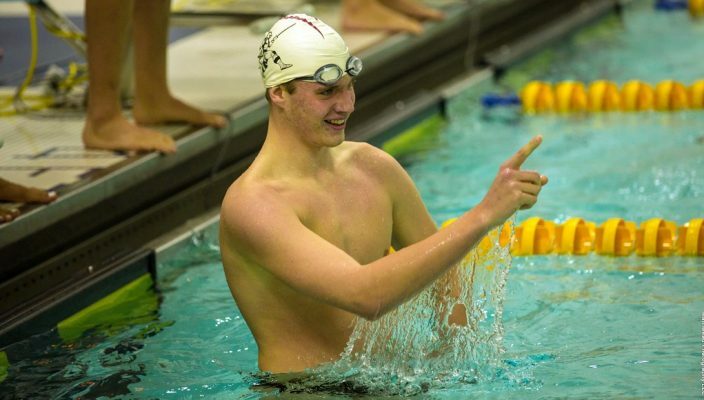 The 200 freestyle relay of Ekas, Allan Collins, Luke Engel and Benedict set a new Carneval Athletic Pavilion pool record with a time of 1:25:09. Robert Bolmanski and Engel were two-event winners. Against John Carroll, Taraska was a three-event winner, while Kunf, Courteney Hubert and Ahl were all two-event winners. The 400 freestyle relay team of Ahl, Kottakis, Hubert and Taraska got the gold for the second time this season (4:07:37). On the men´s side, Benedict and Ekas were three-event winners, while Collins, Gallion, Bolmanski and Thomas Marshall were two-event winners against John Carroll. The 400 freestyle relay team of Ekas, Bolmanski, Collins and Benedict set a new pavilion record with a time of 3:09:80. Marshall claimed his first wins of the season in the 100 and 200 freestyle (48.65 and 1:48.13, respectively). Ekas earned the gold in the 200 backstroke for the second time this year (1:56:26) and Bolmanski picked up his second win in the 1,000 freestyle (9:54:99). He has a total of five wins as a true freshman.